Movie About East LA Walkouts and Brown Berets Begins Filming | Fight Back! Carlos Montes, front, second from left, with actors of Walkout. Walkout is the new HBO film about the famous East Los Angeles school walkouts in March, 1968. Thousands of Chicano students stayed away from school over two weeks to protest the racist school conditions, high dropout rate, overcrowded conditions, lack of books etc. The demands were for bilingual education, Chicano studies, hiring of Chicano teachers and administrators, better facilities, new schools, an end to the high dropout rate, an end to tracking students into the manual arts and in support of more college prep classes. The walkouts resulted in many victories and reforms to the Los Angeles school district. 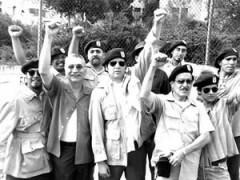 Among others, actors in Walkout will portray Carlos Montes and David Sanchez, leaders of the Brown Berets who helped lead the East L.A. walkouts. Both became part of the legal case known as the East L.A. 13, who were indicted by a secret grand jury for conspiracy to disrupt the school system. The famous attorney Oscar Acosta challenged the indictment on the basis of the grand jury being discriminatory, since it excluded Chicanos, and that the indictment was a violation of the right to protest. The movie’s director is James Edward Olmos, a Chicano actor who played El Pachuco in Luis Valdez’s play Zoot Suit, Jaime Escalante in Stand and Deliver and the lead role in American Me, which was about the Mexican mafia. Moctezuma Esparza, also one of the East L.A. 13, is the executive producer. He produced the movies Selena, Milagro Bean Field War and The Ballad of Gregoria Cortez. The HBO movie will be released in February of 2006. It has created a lot of excitement in the East Los Angeles Chicano community, with many student and parents playing extras in the mass demonstrations. Many of the original East L.A. 13 will also be in the movie playing the role of parents, since they are now older.